Falls are the leading cause of injury-related deaths in elderly people, according to the Centers for Disease Control and Prevention. So it’s important for every senior to take preventative measures. Exercise is one of the most helpful ways to prevent a fall. The CDC recommends activities like tai chi that improve balance while strengthening muscles. It’s important to ask your doctor what exercises are best for you. Some medications can cause dizziness, which may lead to falls. Make sure to carry a list of all your medicines to doctor appointments to check for possible adverse reactions. Also, use the same pharmacy for all prescription fills and refills. 3. Get regular eye exams. The CDC recommends that seniors have eye exams at least once a year. A lack of depth perception can be dangerous when you’re reaching for an object or even just walking around the house. Many homes have hazards that can lead to falls. Be sure handrails are on both sides of the stairways and hallways are properly lit. Eliminate throw rugs and other loose objects that may be on the floor. One of the most dangerous rooms in the house is the bathroom. Installing appropriate handrails, non-slip rugs, and higher toilet seats can help create a safer bathroom space. It is often difficult for individuals to notice safety hazards in their own home due to familiarity. Ask a safety professional to walk through your home and notify you of anything that may be considered hazardous. As advocates for the elderly, Preferred Care at Home offers complimentary home safety checks. 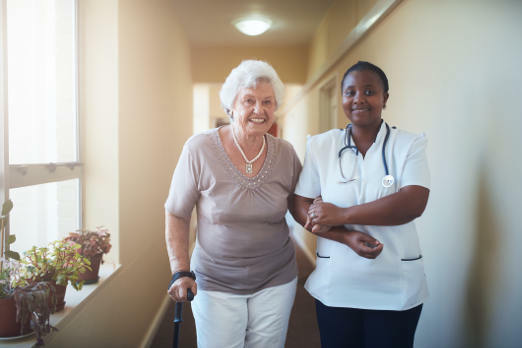 For more information on ways to prevent a fall, or to learn how we can help with home-care services, please contact us today to experience the Preferred Care at Home difference.